products has to be boring. 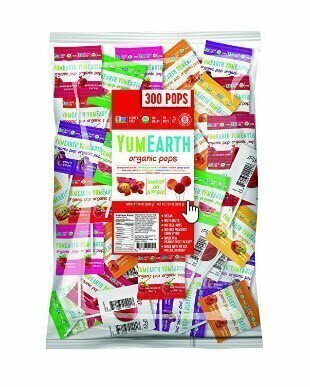 YumEarth Organic Lollipops take a classic childhood candy and make it with ingredients you can feel better about eating and serving to children. YumEarth lollipops do not contain the chemicals, artificial colors or flavorings that exist in most commercially produced hard candy. Real organic fruit extracts replace the artificial flavorings, and they are sweetened with organic brown rice syrup and evaporated cane juice. 3 lollipops are a serving and only 70 calories with 17 grams sugar. Good to keep as a healthy treat in lockers, desks, or in the car. and a big part of their mission is to create treats that are better for you than traditional sweets. They are not a health food or intended to be low calorie, low sugar or any specific weight loss diet friendly. They just treat you are used to but with more natural ingredients and real fruit extracts and cane sugar. There is also a daily dose of vitamin C per serving! Some customers were put off by the uneven distribution of flavors in some bags. Because this is bulk packaging some flavors were more abundant while others were rare. If you know you only like certain flavors, the bulk bag might not be the way to go. A few also had issues with candies being broken or out of the wrapper. For the most part, the complaints were largely due to the general problems of bulk buying: inconsistent variety, lost wrappers, missing flavors or too much of one flavor, etc. Overall, though there were few negatives about the actual products or the ingredients though one consumer was concerned that these were contaminated with corn. If you have a severe corn allergy it might be worth investigating, but there is no corn listed on the ingredient list.